Get married... "Under the Tuscan Sun"! A lot of people felt in love with Tuscany watching the beautiful movie "Under the Tuscan Sun", thanks to the magic atmosphere of the places described... So if you would like to have a special Wedding, why don´t you choose to get married where the movie was set, in the picturesque and marvelous medieval town of Cortona? Few other places in Italy are so characteristic and offer such a perfect scenery for a Wedding! Going down the steps of the Palazzo del Capitano del Popolo with your beloved after you have just pronunciated the most important "I do" of your life, having in front of you the splendid Piazza della Repubblica will be incredible! Then you will take a walk along the narrow streets of the historical town of Cortona with your white dress on, enjoying the unique atmosphere of the little Tuscan town, a real treasure surrounded by a spectacular country... 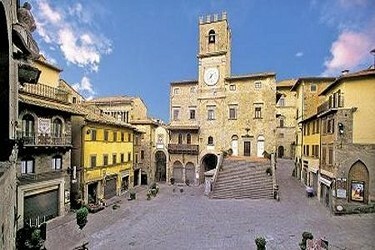 Believe us, your Wedding in Cortona will be magic!